Illstreet Composites has engineered a composite material form described as a COMPOSITE DISC that replaces STEEL and ALUMINUM discs in STATIC and DYNAMIC industrial machine applications. Composite disc material's are produced from a Composite Sandwich structure. The sandwich structure is a staple product in Aircraft composite construction. Composite Disc materials for industrial products are designed using high performance carbon fiber skins separated by a closed rigid cell foam. Basic Composite Disc's for structures that are subjected to low loads. This Webbed Composite Disc provides high shear stiffness. Ribbed Composite Disc's provide high flexural and shear stiffness structures. 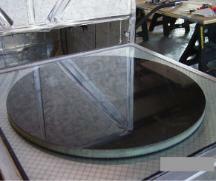 Special Composite Disc's are used primerly for structures that require machining. A 42 inch Diameter Basic Composite Disc. Composite Disc's are used in a wide range of industrial applications. To meet these varied needs Composite Disc's are manufactured using several foams. 2 lb/ft^3 Unreinforced Foam - Polyisocynurate (PU) foam. Used in the manufacture of Basic, Ribbed and Special Composite Disc's 5 lb/ft^3 Unreinforced Foam - Polyvinyl Chloride (PVC) foam. Used in the manufacture of Basic, Ribbed and Special Composite Disc's. 6 lb/ft^3 Unreinforced Foam - Polyisocynurate (PU) foam. Used in the manufacture of Basic, Ribbed and Special Composite Disc's. Reinforced Foam - Polyurethane (PU) foam reinforced with glass-cloth. Used in the manufacture of Webbed Composite Disc's. The Composite Disc strength and stiffness is provided by a Carbon Fiber Radial Laminate. The Carbon Fiber Radial Laminate is built from layers. The number of layers dictated by the Composite Disc application and laminate balance. Shown in the table are Composite Disc's with Radial Laminates with up to six layers. Depending on the application more layers can be added to the laminate to increase stiffness and strength. The Composite Disc Radial Laminate is protected by a Carbon Fiber Hybrid Surface Skin. Surface Skin material and coating options are available.